Meditation on the Tibetan Book of the Dead. A contemporary edition of the ancient tibetan meditation about the transition called death: the dissolution of body-mind, and ego-personality, and the possible conscious choice of a new rebirth following a conscious death. A conscious death, and a conscious birth, hold the highest potential for an authentic spiritual awakening. The BARDO meditation "AWAKENING FROM THE DREAM" is designed to incorporate a lifetime of spiritual practise into the moments of transition we call death. It helps us to chart a path through the states of consciousness as they are experienced after death. Our intention in creating this meditation is to evoke courage, resolution, understanding of our transition in dying, and in this way a conscious , graceful death. It is also an opportunity for the listener , wherever he/she may be on the continuum of life, to relax and feel supported in understanding that being alive is a precious gift that provides the unique choice of preparing for a conscious death, by living a conscious life, and the possibility that our transition can really become the peak of a lifetime, the conscious "returning home" to our real nature, our essence, which has never been separate from the whole. The text reminds the listener to constantly recognize that all phenomena are projections of one´s own mind. In this way it attempts to liberate the listener from clinging to old desires and beliefs of separation, which cause fear and self-protection. This encourages the meditator to merge into their original nature. Tibet is no more the old Tibet, but we can create the situation, the psychology, where Bardo - more evolved- can help people. It is a beautiful process. Just as Japan has brought Zen from buddhist sources of meditation, Tibet has brought from the same buddhist sorces of meditation BARDO. These are their immortal contributions. Listening to these CDs, you will be in an altered state of consciousness. In this receptive state, your memory system in the subtle body will store the process so that you are able to remember it after your physical death, when body, mind and personality are disintegrating , and the components of your consciousness dissolve into the elements. The witness of a meditator will be present through the transits of BARDO, the choosing of the next lifetime, the womb experience and the birth experience. BARDO is a process of soft hypnosis, guiding the listener into an altered state of consciousness, and onward through the transitional stages of BARDO. These CDs can be used as a meditation with full awareness, as a preparation for and a guidance through the dissolution of the identification with body and ego-personality after the physical death has occured. This edition is special in that it translates the ancient reading of the Bardo into a language that can be understood by the contemporary man. This edition offers a holistic, almost scientific understanding about the neuro-physiological processes in the dying process, the spiritual dimensions of dying, and of the preparation for a conscious death, free from fear and suffering. Bardo makes us aware of the urgency of a conscious life, a life of compassion and respect for all life forms. It reminds us of our responsibility to use this consciousness to transform ourselves and our being here in the world for the best of all living beings. The preparation for the transition of a conscious death happens in life through deep levels of meditation, through authentic love and compassion, a life of sharing and receiving. A life which reaches towards the highest peak of human consciousness. The realization of Enlightenment can happen at any moment, and the moment of a conscious death is a most potential moment to realize our oneness with all of existence. 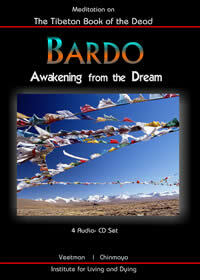 BARDO is a preparation for this moment and the beginning of the soul´s transition from one life in form into another.